Portland - Travelers will experience the first major delays for the Interstate 84 at Interstate 5 Rehabilitation Project and the I-5 Interstate Bridge to Hassalo paving project. The ramp that connects I-5 southbound to I-84 eastbound will close 24-hours a day for two-weeks from 10 p.m. Sunday, July 8 to 5 a.m. Monday, July 23. During the closure, Hamilton Construction, will replace 16 bridge joints that link the ramps, , remove the existing concrete, perform repairs to metal below the concrete surface and emplace new concrete. As the concrete cures, traffic cannot use the ramp. Travelers should expect delays and backups on I-5 southbound that last most of the day and night and that could stretch to the Interstate Bridge during this closure. Information on options to avoid delays are available at BigFixPDX.com and on an online open house. TriMet’s MAX Light Rail System is a great option to avoid the traffic congestion. TriMet has a number of free Park & Rides in outlying areas that connect with their services. *Additional spaces available weekdays between July 8-20, July 25-Aug. 6 and Aug. 17-27 for a fee. Travelers can download the closure schedule to their calendar. During these westbound ramp and lane closures, it is expected that it could take up to three hours to travel between I-205 and I-5 along I-84. Backups are expected to stretch to Troutdale along I-84 and to the Glenn Jackson Bridge and to Sunnyside Road along I-205. Backups are also expected on local streets as people detour around the I-84 closures. Travelers should plan ahead to avoid delays. Visit TripCheck.com before heading out. 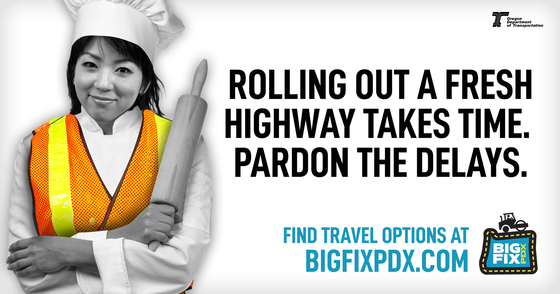 Information about detour routes and what travelers can do to avoid gridlock is available at I-84 at I-5 online open house and BigFixPDX.com.